Chronic kidney disease (CKD) affects more than 30 million Americans. It causes more deaths than breast cancer or prostate cancer and, approximately 90% of those with kidney disease don’t even know they have it. The best treatment is early detection so that CKD can be slowed or stopped. Early treatment includes diet, exercise, and medications. However, once kidneys fail, treatment with dialysis or a kidney transplant is needed to survive. Nearly 680,000 Americans have irreversible kidney failure, or end-stage renal disease (ESRD), and need dialysis or a kidney transplant. More than 475,000 ESRD patients receive dialysis at least three times per week to replace kidney function. Nearly 100,000 Americans are on the waitlist for a kidney transplant right now. Depending on where a patient lives, the average wait time for a kidney transplant can be upwards of three to seven years. The National Kidney Foundation is calling on Congress and the Administration to make organ transplantation a top priority and has identified several critical areas to be addressed from a legislative and regulatory standpoint. These priorities will create a strategic and effective path forward towards increasing the number of kidney transplants and decreasing the number of patients who die waiting. a. Expand financial assistance offered to living organ donors to cover all expenses related to organ donation including lost wages; travel expenses including transportation, lodging and food; child care or dependent care expenses incurred during the donor’s recovery; living donor medical care and follow-up care for donation; paperwork or legal costs related to the donation; and other expenses related to the donation. b. Pass the Living Donor Protection Act to ensure job protections for organ donors who need to take medical leave to recover from organ donation surgery and insurance protections, so organ donors are not denied or charged higher premiums because they donated an organ. c. Support community-based programs, like the National Kidney Foundation’s THE BIG ASK: THE BIG GIVE, that seek to educate kidney patients and potential kidney donors on the benefits and risks of living donation. 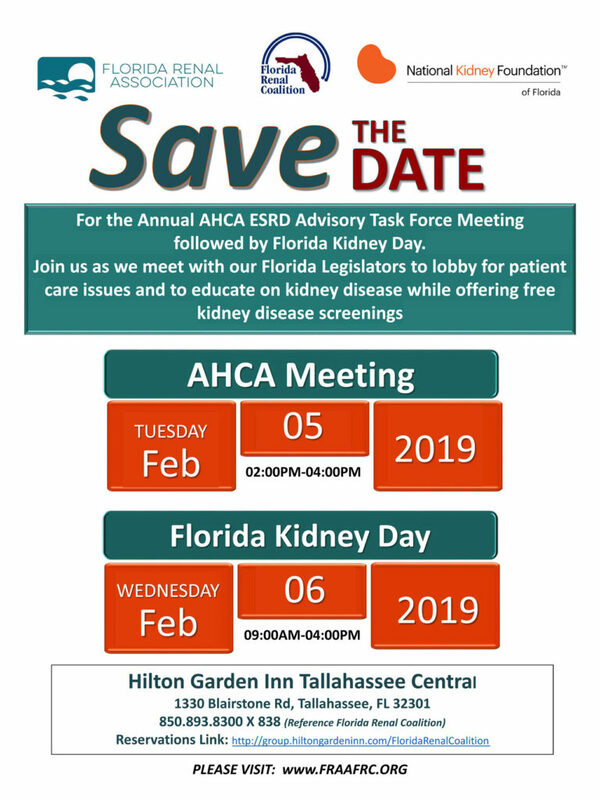 a. Align Medicare and Medicaid reimbursement to healthcare providers to encourage earlier care of CKD patients and preemptive transplants for those who do progress to ESRD. 3. The National Kidney Foundation has recommended a demonstration program to the Centers for Medicare and Medicaid Innovation that would take a patient-centered approach to testing changes in payment and care delivery. a. This program would put an emphasis on decreasing the demand for organs by preventing or slowing progression of kidney disease. For those who do progress to kidney failure, it would increase the number of people who receive a kidney transplant, ideally before ever needing to start dialysis. a. Currently, patients only receive Medicare coverage for 36 months post-transplant. Permanently extending Medicare coverage of immunosuppressive drugs for the life of a transplant is critically important. It will enable recipients to receive immunosuppressive drugs that they are required to take daily to help reduce the likelihood of organ rejection. For many patients the costs associated with immunosuppressive drugs are prohibitive, leading patients to skip doses and risk organ rejection, or, in many instances, not trying to get a transplant. • Unfortunately, it is not possible to accurately predict how well an organ will perform. Further research into this area of organ performance is needed. • NKF is advocating to remove use of high-risk kidneys from this metric and to develop a patient quality of life metric one-year post graft survival. • The current metric of observed to expected survival of graft for one year has high performance, but the perception is that this metric has the unintended consequence of causing overly conservative behavior when evaluating high risk kidneys leading to the discard of organs that could give someone greater quality of life in the short and long-term. b. Increase transparency and patient-shared decision making in organ offers made to patients. Currently patient consent, at the time of transplant listing, is required for accepting kidneys with a high kidney donor profile index or kidneys that are HIV and/or Hepatitis C positive. Patients still have the right to refuse such an organ when an offer comes. However, patients may not be informed of all organ offers of high-risk kidneys leaving it to the transplant surgeon (or the program’s representative) to make the sole decision on whether the organ is suitable. NKF believes patients should be informed of all offers. c. OPTN should identify transplant programs that never or very rarely accept high risk kidneys and make changes to the kidney allocation policy to allow Organ Procurement Organizations to direct donations of high-risk kidneys to programs that are most likely to use them. Transplant programs which do not use these organs can voluntarily opt out of the allocation process for these kidneys. Disclosure of the transplant program’s decision to opt out or a transplant program that is bypassed due to the likelihood it will not accept a high-risk kidney must be communicated to patients for patients to determine if alternate listing at another less risk averse transplant program is necessary. d. OPTN should develop a standardized process that all transplant programs and donor hospitals must follow to determine their genuine interest in viability of an organ offer to accelerate the time the kidney is out of the body and in cold storage. This includes standardization on how to conduct a biopsy when a transplant program requires one and how to obtain and review photos of the organ for the transplant program to determine usability prior to accepting allocation. This also includes the need for trained pathologists to interpret and report the results of deceased donor kidney biopsies at the time of organ retrieval. e. Change the kidney allocation policy to require each OPO to have at least three back-up transplant programs ready to accept the kidney if the first program declines. This will reduce the time the kidney is out of the body and in cold storage, which decreases the quality of the organ putting it at greater risk of wastage. f. Changes to Medicare reimbursement should be made to allow for higher risk adjusted payment when a high-risk kidney is transplanted. There is additional cost to the transplant program in transplanting these organs and therefore reimbursement should be adjusted as well. This would remove one barrier to better use of high-risk kidneys.